In the fall of 2013, the Skidmore Student Garden was given the opportunity to relocate from its old home on North Broadway to the more centralized Weicking Green, across from the Case Student Center and adjacent to McKlellan and Weicking, two student dorms. With input from Student Garden members, the following design was drafted and presented before the College administration, which approved the design in early 2014. Ground was broken that May and the Garden was opened for its very first season by June. 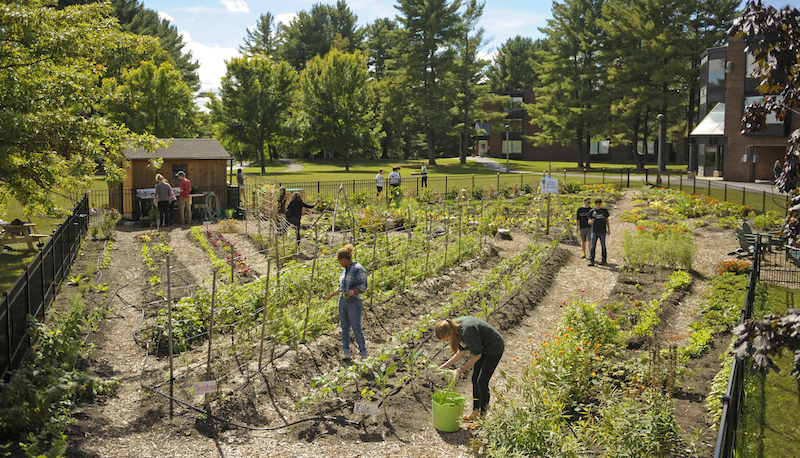 In recognition of its central location and communal aspirations, the Garden was renamed to the Skidmore Community Garden. The irregular shape of the garden was inspired by wings of a monarch. The shape was necessary, due to the natural topography of Weicking Green. Permaculture principles were applied to accommodate this topography, with garden beds design to retain water runoff, while simultaneously imitating the markings on a monarch wing. One of the goals the Garden members had was to create a place that was welcoming, and could be used for multiple purposes beyond agriculture. Subsequently, places for rest were incorporated into the plan, and a pergola with a small stage made its way onto the final concept to be used for open mics and other community events. Garden members getting hands on during a design meeting. The Student Garden members were very passionate about the project and very hands-on during the design process. While they wanted the Garden to be prolific in yields, they also wanted to ensure that it was aesthetically pleasing, ecologically-sensitive, and welcoming to the entire campus body. The fence was the first thing to be installed, courtesy of the Grounds & Maintenance department. The rest of the installation was done by Garden members and volunteers. By the end of the school year, the Garden was open and ready for its inaugural season.